« Fibre tax no longer fit for purpose? The whole thing is a farce. A superfarce. ‘The emperor has no clothes’ whispers the little boy. Thank you. What’s the difference between line length and cabinet length? Substitute Towns and Cities for ‘clubs’ and apply to Ofcom viewpoint. An own goal methinks. Why all the mention of GPON? BT uses Point to Point Gigabit Ethernet between the exchange and the VDSL cabinets, certainly for the ECI Telecom kit, which is making up most of the installations these days. ECI F152-HB OLT in the exchange and the HI-FOCUS M41 MSAN in the cabinets. Virgin use Radio Frequency over Glass (RFoG), simply converting the radio signals from a DOCSIS cable MODEM head end into light, and stuffing it down a fibre. In the cabinets the light is converted back to electrical signals for coax cable. 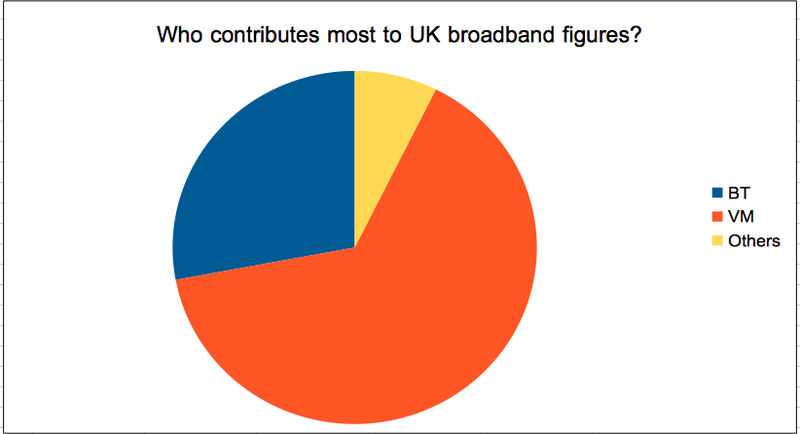 GPON is however the offering for their FTTP deployments for the lucky few. >> GPON is however the offering for their FTTP deployments for the lucky few. Vm doesnt use RFoG. It is DOCSIS 3.0. Over a HFC network. Trust me,I build and support it. Perhaps you can expand a little on what HFC is within VM, because as I understand it HFC is RFoG for the fibre part at least. Ie the signal on the fibre is a modulated radio frequency signal, not a pulsed signal as would be the case in Ethernet / GPON etc. Thus the opticla nodes out in the cabinets feeding the coax drop to customers are dumb media converters, not active network equipment like an Ethernet switch. I notice this statement about ‘superfast’ and 30 Mb/s being made again here. WHY then do so many BDUK projects use a different figure for ‘superfast’ of just 24 Mb/s. WHICH IS IT – 24 or 30? About a year ago Ofcom revised its definition of superfast from 24Mbps to 30Mbps, in line with European Union targets, because the UK has said it supports EU broadband targets. This is a very material point because of the attenuation issue; signal strength degrades with distance, so to receive a 30Mbps service you need to be that much closer to the street cabinet. It is suspected that BT persuaded the powers that 24Mbps is “superfast” because Openreach’s average line length between the cabinet and the premises would support 24Mbps, but not 30Mbps. Having a 30Mbps target for 100% of the country would require BT to build cabinets closer to homes, and a lot more of them. The cost of this would be high as it requires lots of civil engineering. I am guessing this was spelled out to local authorities who then looked in their bank accounts and decided to go with the 24Mbps figure. Apparently BT plans to run fibre to the distribution point as a way to shorten the distance to homes, but that does not seem to have been costed or budgeted for yet. Increasing the power of the signal so that it would go the extra distance risks causing interference on neighbouring lines. If the lines were fibre, this would not be an issue as fibre does not suffer from electrical cross-talk. Bottom line: the UK is unlikely to meet the EU targets of 30 Mbps for all, with 50% of subscribers using a 100Mbps service by 2020, no matter what Ed Vaizey says about having the “best broadband in Europe”. I am at CeBIT in Hannover and watched David Cameron and Angela Merkel spar about their releative Broadband plans. I guess that was well covered in the UK Press and I am still in Germany. My friend in Bucharest currently gets 100Mbps for 10 Euros a month in his apartment. Gigabit will be available shortly. We would be pleased to meet you all and have a discussion about the inadequacies of Business Broadband in Britain and particularly receive any case studies as ammunition when we meet Ofcom. All that technical debate over acronyms and abbreviations is great for you BTOR engineers – what about the poor old customers who are subject to having no idea whether ‘superfast’ means a TRUE poential to have a copper phone line circuit supposed to deliver them 30+ Mb/s like ‘superfast’ is supposed to mean – rather than just a copper phone line that’s been conveniently redefined based on ‘up to’ 24 Mb/s – redefined entirely to enable a monopolistic encumbant to whitewash government and local authorities into handing out millions of pounds of public money towards so called ‘superfast’ connectivity that is in reality more of a SUPER-FARCE than genuine ‘superfast’ – because all that’s been done is a redefinition of terms. Wiber - High Point Infrastructure Ltd.
Superfast and how it delivered is immaterial when all you have is intermittent and very expensive 3G.